No, really: I have a partial post drafted explaining why I think I threw myself into making baby quilts over the past year. I have completed three (if you count the few inches of binding left on one). There are at least three more in progress, and fabric waiting to be cut for another one or two more. And why? Well, the short answer is, it was a delightfully fun distraction from finishing my MFA application manuscripts. The longer answer is that I’ve rediscovered a joy for sewing that my mother and grandmother cultivated when I was a child. So, this year I finally signed up. 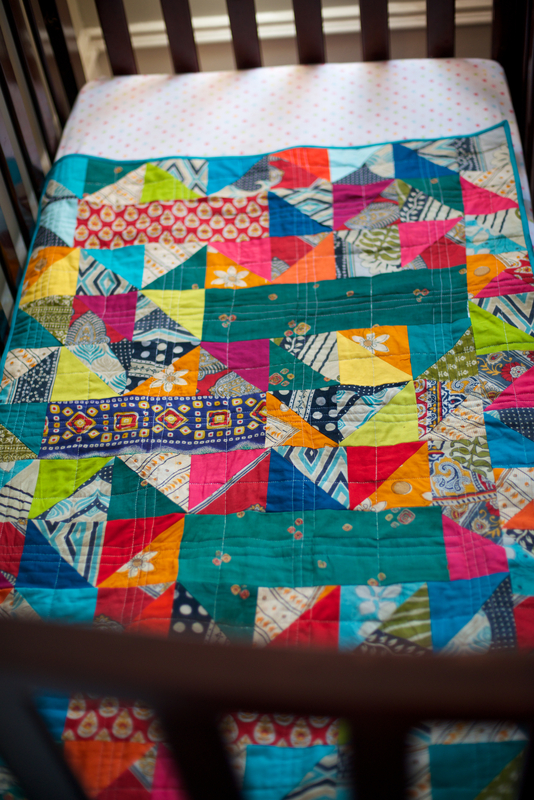 Originally I wanted to do two baby quilts OR HEY MAYBE A QUEEN SIZE (let’s pause and laugh about how I thought I would finish a queen size quilt between December and March with my schedule….not to mention the fact that I have NEVER QUILTED SOMETHING THAT BIG YET!). 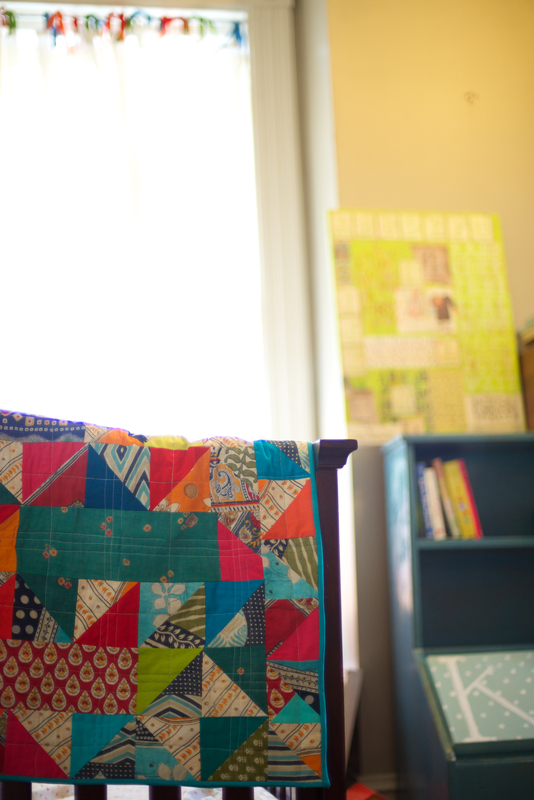 When the fabric arrived, I saw a cool-tone version and a warmer version of each baby quilt emerging. I got off to a late start with a shipping mixup for my sari fabric. I drastically underestimated the amount of time it would take me to work with sari fabric (I’m not entirely new to sewing, but still new to quilting and had never worked with such delicate fabric for a quilt before). It took twice as long to simply prepare for sewing: the fabric needed reinforcing before I could even cut the squares. Because I knew time would be a major constraint for me (because hello job and kids! ), I settled on my now-familiar half-square triangles. The quilters are given a bit of freedom to interpret how the quilt comes together; there’s no rule for how to use the sari fabric, per se, though most of the participants create quilts that are almost entirely constructed from the sari fabric. I knew I wanted to have some solid jewel tones to break up the busy prints and help them sing a little more. I was making good, if slow, progress, most everything was cut and planned, and I only needed one or two more weekends to rock it out after the kids went to bed to make the March deadline. But then: life happened. And honestly, this quilt was one of the last things I could get to — and not for want of finishing it. In fact, it was almost always the first thing on my mind, and I even woke up a few times to work on it at 5 a.m., getting a chunk done before work. Truthfully, though, the news at Sweet Briar College became all-consuming, at least for every spare part of me that wasn’t already consumed with the hectic world of Toddlerville. 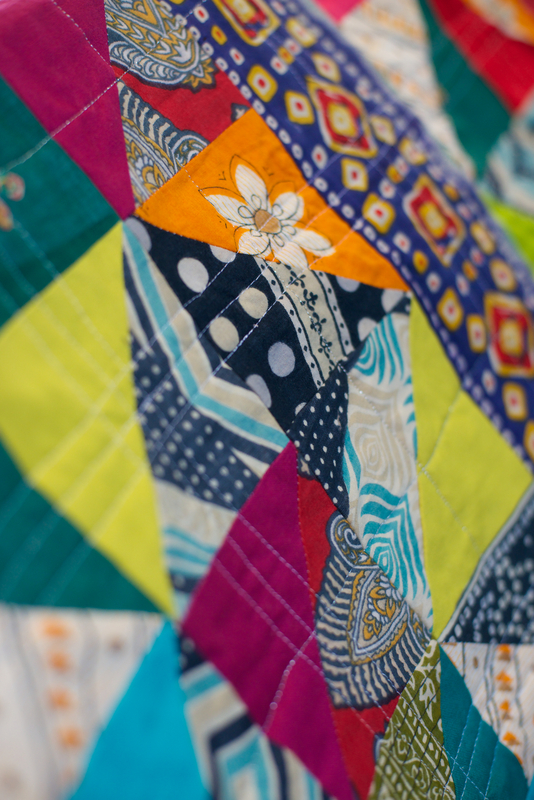 In the interest of time, I combined the colors into one bright, crazy quilt. Just one. A baby size. Nothing crazy, and even that took forever. You may notice this is the first weekend in May, and that the auction is currently live. Well, folks, in the spirit of true transparency: I tied the final knot in the final stitch of the binding last night. Tomorrow, I’ll overnight it to the lovely ladies who are organizing the auction. I’ve already apologized over and over, and they’ve been so gracious. It felt like I would never finish this tiny, tiny quilt (seriously: some quilters made QUEEN SIZED QUILTS and got them in early!! Clearly, they need to teach me some project and/or time management wizardry). It’s so not perfect. But honestly, I don’t want to let it go: I love the vibrant blend of colors, and I figure someone else will, too (hey, it would make a great bohemian backdrop for newborn photography….hint hint). At the very least, I’m pretty sure my dad will bid on it. I love how cheerful it turned out! Here’s the thing: even before learning that I’ll lose my job this summer, it was already incredibly sobering to work on this quilt because I wanted to, in my spare time, with a roof over my head and from a place of such relative freedom and ease. I was not sewing for hours per day in inhumane conditions just to bring home a paltry paycheck. I do not have to sell my body to put food on the table for my children. If sewing a quilt can help provide freedom for another mother, half a world away, it is the least that I can do. 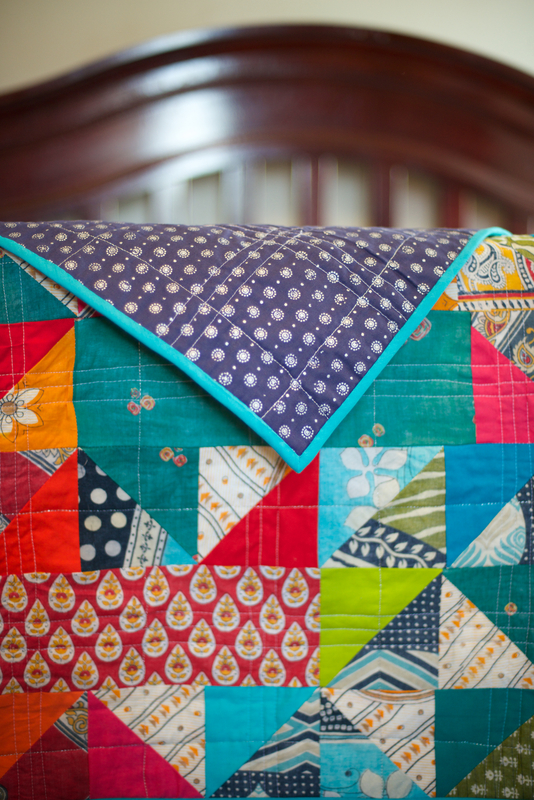 So, without further ado: I present my entry in the 2015 Sari Bari Quilt Auction. When the new @yomamacrockett storefront is so close, and the donuts are so fresh, that your donut is still warm after walking home in a chilly breeze. I took my tiny dancer to see the Nutcracker at the Academy tonight. Still can’t believe that beautiful theatre is restored! We live a half block away from our precinct, and I walked in the pouring rain to vote. Worth it! If you need help with childcare or a ride to vote, let me know!! Today, I went to the first Hispanic Heritage Festival in Lynchburg and it was SO GOOD to be among fellow Latinx members of our community. Speaking Spanish, listening and to Latin music, seeing so many families, and enjoying delicious Peruvian chicken... ¡Ya esperando al festival del proximo año! A Busy Mom’s Friend: Two Shopping Apps I Love! Enter your email address to follow Meridith Creates and receive notifications of new posts by email.